Of all gifts, the gift of Dhamma is the highest. For many more freely distributed books and recordings as well as downloads, visit the Abhayagiri site. Visitors may borrow from a wide range of books about meditation and all forms of Buddhism as well as other spiritual practices such as Christianity, Islam, and Hinduism. 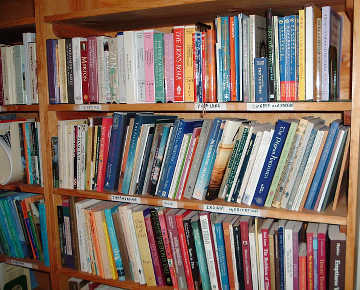 Selections include fiction and poetry as well as non-fiction history and teachings. Periodicals such as Tricycle, Shambhala Sun, and Inquiring Mind are also available to be shared. Below are materials freely offered through the faith, effort, and generosity of people who wish to share the Dhamma teachings with whomever is interested. Ajahn Chah was a master at using the apt and unusual simile to explain points of Dhamma. The translations of these similes have been polished as little as possible, for their unpolished nature is precisely what reveals unexpected layers of meaning. This book is a companion to It's Like This. Ajahn Chah was especially talented at exploiting the open-ended nature of the simile - using a particular image to make one point in one context, and a very different point in another. This book is a companion to In Simple Terms. A collection of eight new or significantly revised translations of Ajahn Chah’s Dhamma talks by Thanissaro Bhikkhu. Two of them have never been translated before into English, and four of them are based on entirely new Thai transcriptions of the best and most complete source recordings available. This booklet offers a very clear and concise overview of Buddhism and its core teachings and addresses many questions that people unfamiliar with or new to the teachings often raise. This succinct book, describing meditation tools and techniques for beginners in a series of lessons, is based on a six-week series of classes given in Mendocino, California, in 2002. The aim of this booklet is to serve as an introduction to the practice of Insight Meditation as taught within the tradition of Theravada Buddhism. The ancient texts of the Dhammapada rendered into accessible English as themes for personal contemplation. This book is derived from a talk given by Luang Por Pasanno recounting teachings on nature by Ajahn Chah. It was published in commemoration of Luang Por Pasanno’s 63rd birthday July 26, 2012. A collection of three Dhamma talks that Ajahn Pasanno gave in the three winter retreats during 2003-2005 at Abhayagiri. Half raucous adventure and half inspirational memoir, Rude Awakenings documents an unusual pilgrimage. Two very different men — life-loving naturalist Nick Scott and austere Buddhist monk Ajahn Sucitto — together spend six months retracing the Buddha’s footsteps through India. Rude Awakenings is a heady record of survival and spirituality set against the dramatic backdrop of one of India’s most lawless regions. This book is a sequel to Rude Awakenings, which began the account of a six-month epic journey by two Englishmen, a monk and layman, to the Buddhist holy places in India. "While the second part of the journey still had its share of adventure... the novelty of the endeavour had worn off, and we came face to face with both our own and the other’s deeper humanity." This mp3 CD contains Dhamma talks, guided meditations, and questions and answers from the 2013 Abhayagiri Monastic Retreat which occurred from November 22 to December 1 at the Angela Center in Santa Rosa, California. Includes a pdf file of an index of talks and questions. This mp3 CD contains readings and reflections from the Abhayagiri 2013 Winter Retreat. After an introductory series of talks on meditation, Ajahn Pasanno, Ajahn Karuṇadhammo, and Ajahn Jotipālo read selections from the Pāli canon and other sources focused on the five hindrances, five aggregates, six sense bases, seven factors of enlightenment, and the four noble truths. Includes a pdf of liner notes. Ajahn Pasanno expounds the 16 steps of breath meditation from the Anapanasati Sutta in a series of 19 talks from Winter Retreat 2005. Includes a pdf file of an index of the contents.